One of Cape Canaveral’s top attractions, the Kennedy Space Center is about a 25-minute drive from the Country Inn & Suites. Book one of our affordable packages to experience what life is like as an astronaut by simulating a walk on the moon and piloting a space shuttle. You can also see views from the Hubble space telescope and visit the Rocket Garden, home to replica rockets up to 100 feet tall. Throughout the year, the center hosts events such as Lunch with an Astronaut and Astronaut Encounter, where you can meet and talk to a veteran astronaut about his or her space voyages. Enhance your stay with a space-themed Family Suite! To request a specific theme, leave a comment with your reservation when booking online, or contact the front desk at +1 (321) 784-8500. Browse more than 60 interactive exhibits and high-tech simulators for a historical look at manned space flight. Spend hours learning more about everything from the construction of the International Space Station to the Hubble Telescope. 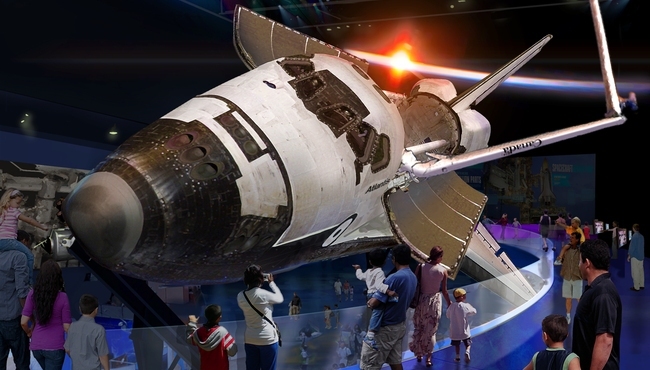 Climb aboard Space Shuttle AtlantisSM to view space from an astronaut’s perspective. For more information, please call +1 (866) 737-5235. For a one-of-a-kind space adventure, take time to engage in the Shuttle Launch Experience that transports you from countdown to launch, and then into an eight-minute orbit around Earth. Prepare for your mission with a briefing from veteran astronauts, and then enter the shuttle to go step-by-step through the launch sequence. After liftoff, experience g-force acceleration as you head into space. Let the Country Inn & Suites be your mission control during your exploration of Cape Canaveral. With comfortable hotel rooms and out-of-this-world-amenities, you can enjoy a restful sleep and be recharged for another day of adventure. Interested in viewing a launch? Learn more about upcoming missions and view the calendar of events on these two informative websites.